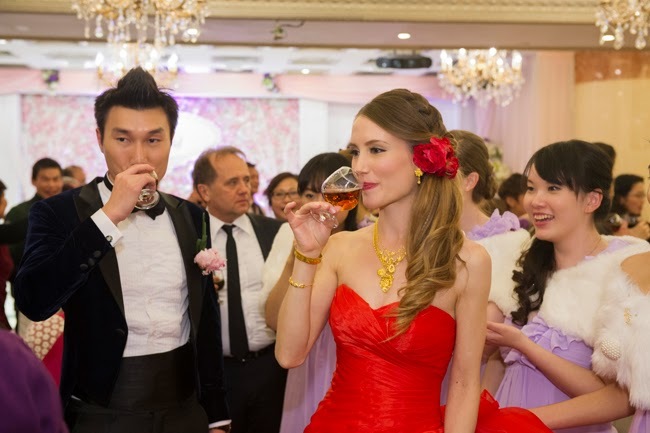 As you all probably know, on December 29th, 2014, J and I had a wedding reception in Hong Kong to celebrate with all our family and friends there. 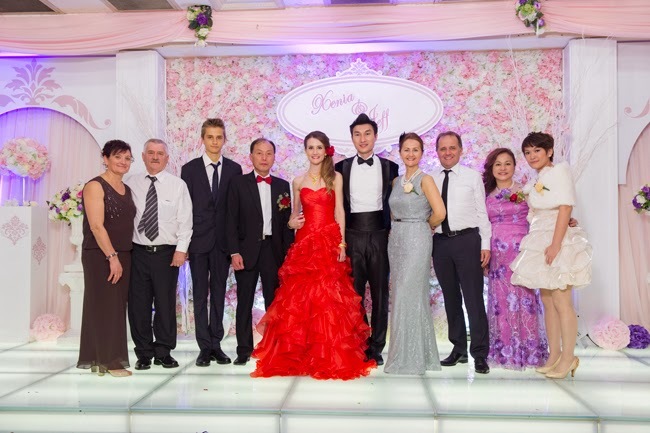 The reception took place in a Chinese restaurant which specializes in wedding banquets, where we held a dinner for more than 200 guests. During most part of the dinner, I wore a red dress, and these are the pictures I'l be sharing with you today. Next time, I'll show you my other two dresses, the one I wore on my wedding day, and the white wedding dress I first bought. I loved my red dress, I bought it online for a very good price, and was delighted with it as soon as I tried it on. 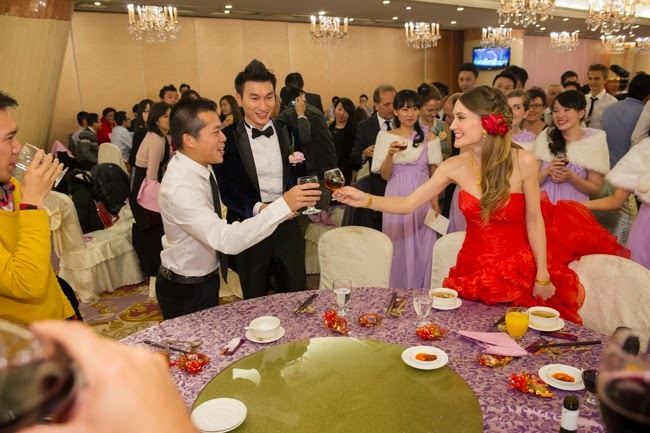 As you will see from the pictures, Hong Kong and European weddings have nothing in common. In Europe all guests are expected to come in their best gowns and suits, while in Hong Kong, people show up really casual. 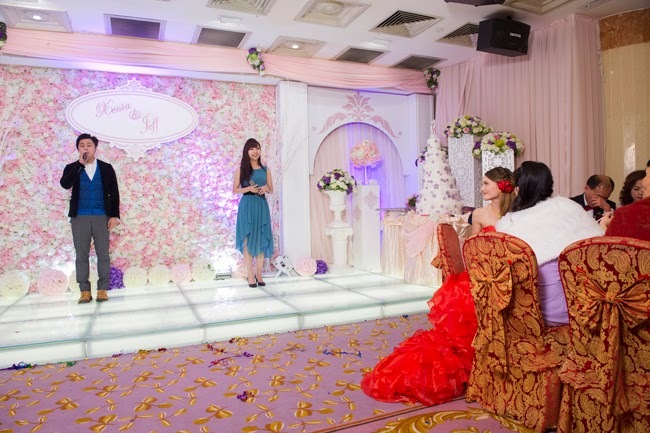 Chinese wedding receptions also tend to be way more massive than western ones, with lots and lots of guests, several of which are the bride and the groom's parents friends. That's why I feel Western weddings are more centered on the bride and the groom, while in Chinese ones parents play a big role. 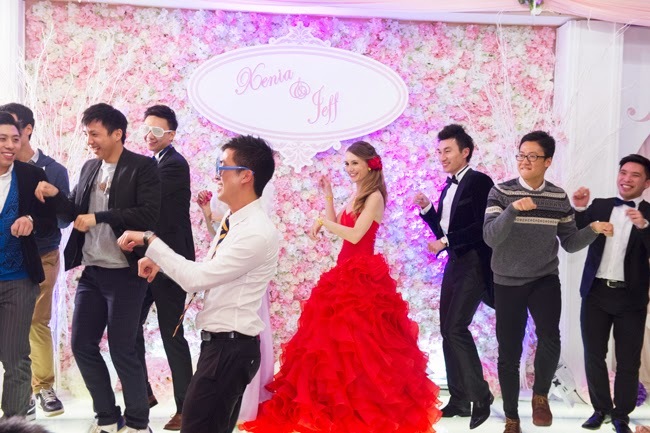 It was lovely being able to share the joy of our wedding with everyone we love in Hong Kong, but with so many people the truth is it was impossible to properly care for every guest. As you can see, I was wearing lots of gold jewelry, all presents from our guests. 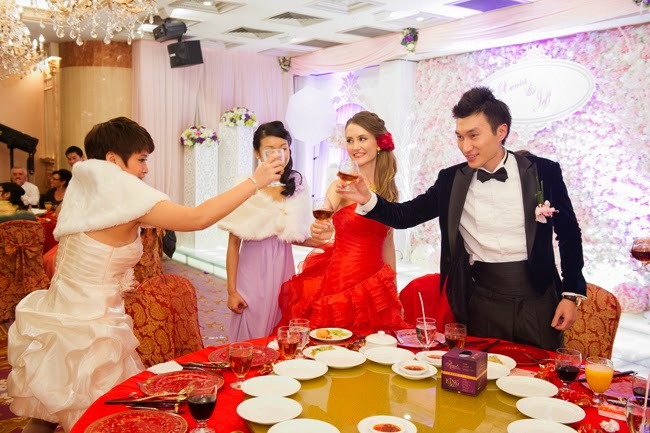 It is customary in China to give gold to the bride and the groom, and the bride wears it with her red dress. We had lots of performances going on during the dinner, we had two amazing MCs who conducted the whole thing from the stage, and a couple friends with stunning voices that sang some lovely songs. I have to say I loved the decor of the restaurant. The stage wall was full of white and rose roses, which reminded me of our white and pink wedding in Catalonia! This color combo is one of my favorites ever, so no wonder I was delighted with it. 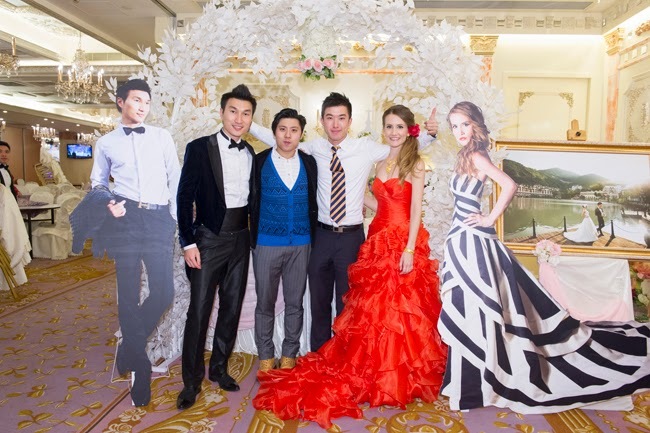 This is how we decorated the reception area of the restaurant, with our real-size selves like in our Catalonia wedding! And last, we had a blast dancing in the stage once the dinner was over. 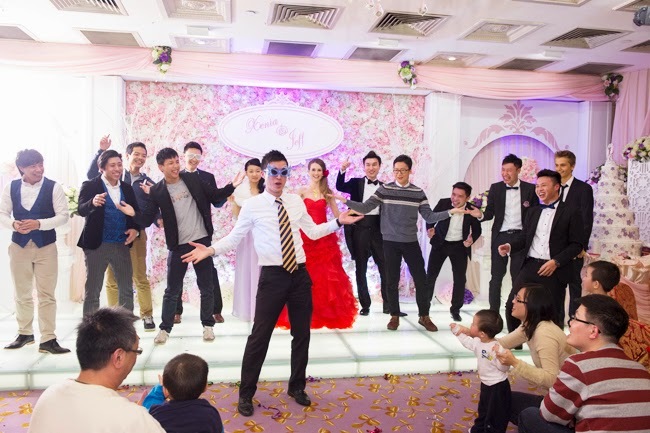 I want to thank our awesome Master of Ceremonies and friend, KC Leung, for all the effort he put into our wedding, and for cheering everyone up with his dance moves. A while ago, I mentioned my wedding photographer, Noemi Jariod, and I had decided to take some pictures of myself right before my wedding, on that same morning. Somehow I forgot to show you the lovely pictures from that session, but luckily someone reminded me about it today! I took them before putting any makeup on, so I was a bit worried about how my face would look, but I think they came out really good! ^.^ The pics were taken in the garden of a house next to my wedding venue, and I believe the result is truly gorgeous. 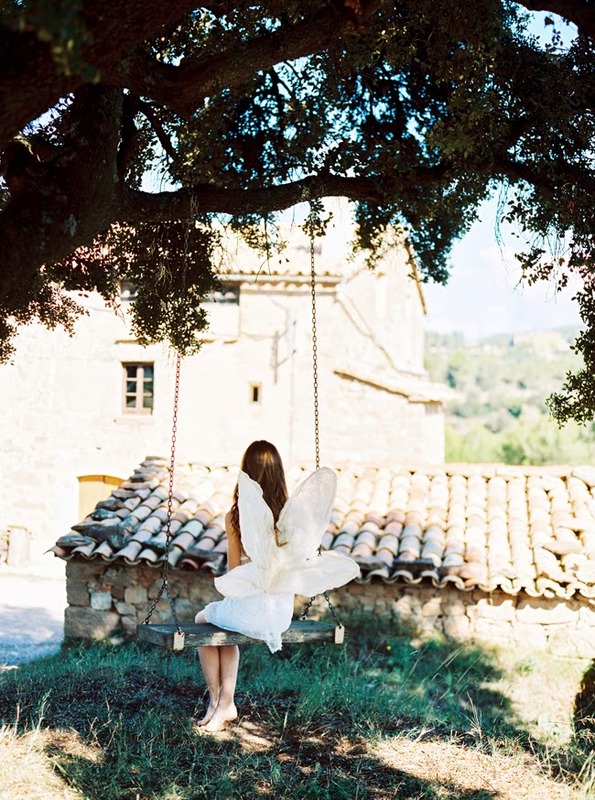 That house has a very special swing that hangs from a tree, so the location was already magical by itself. Then we added a pair of fairy wings from Mireia Abras, a florist and decorator with a lovely style, and I wore some white clothes to get the fairy look. I think I succeeded, what do you think? All the pictures were taken with a 35 mm film camera, which is so rare nowadays! The light is all natural and the pics are not photoshoped, I think they are pure art. Hope you like them! Our honeymoon was an unforgettable once in a lifetime experience, it was SO good! 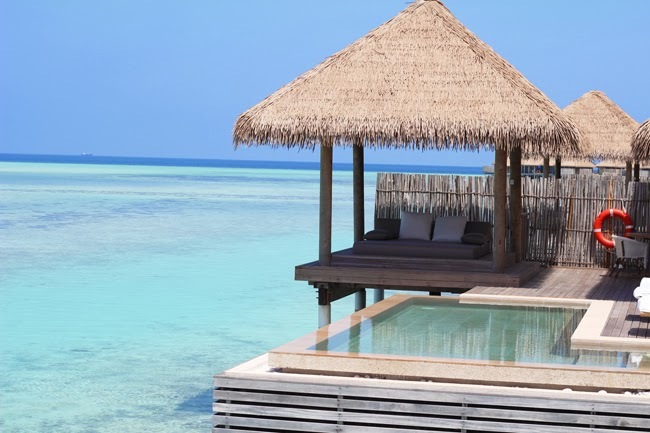 I don't think J and I are the only ones to have been caught daydreaming about over the water villas on a turquoise sea during our childhood and well up until now! It's something you see in magazines, on TV, on the internet... and catches your eye right away. We're so happy to finally having had the chance to visit such a dream place! We spent months doing research trying to find the hotel that would better meet our expectations, and we were not disappointed (or just a bit, more on that in a while). 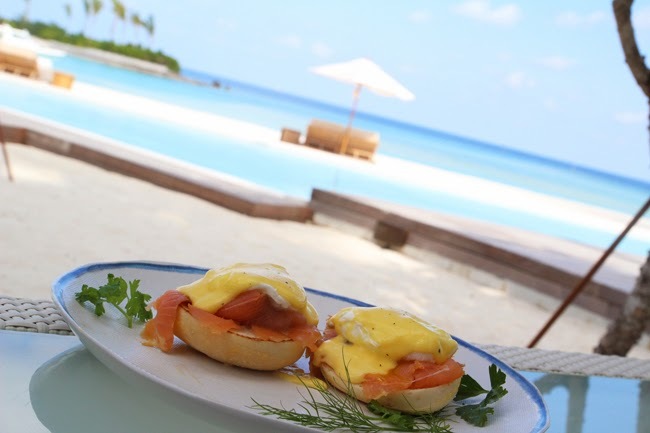 The resort we stayed at is the newly opened Maalifushi by COMO, which occupies the whole Maalifushi island, about 45 minutes away from Male. It was the soft opening of the hotel during our stay, meaning that some of the villas where still under construction, for which we got some special promotions, like full board for the price of half board, which was such a bargain! We stayed at the resort for 6 days, which was just about right, taking into account you couldn't get out of the island! Well, we did kayak to the nearest inhabited island, but that's about it. 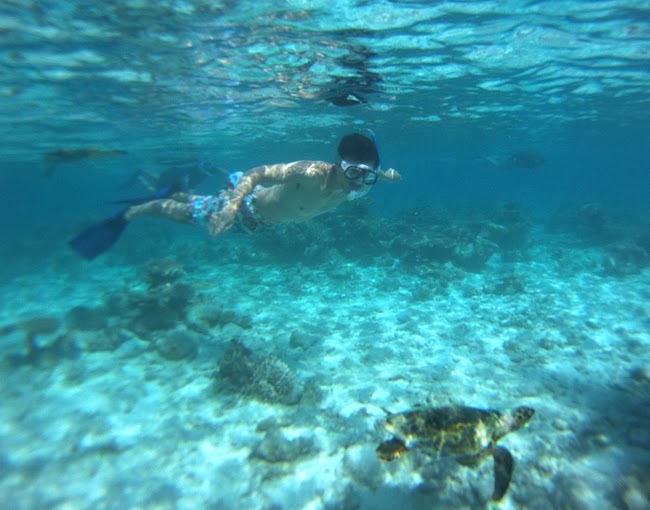 The hubby swimming with the sea turtle! 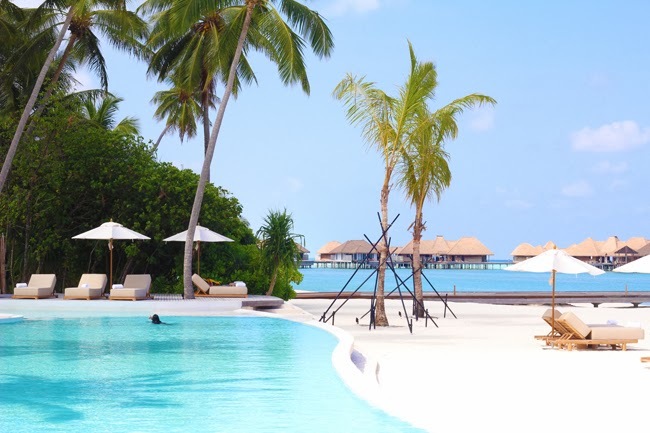 We loved the resort, the facilities, our water villa, the amazing food... everything was outstanding. The only thing we were disappointed about was the transportation. From the very beginning, only resorts which had a seaplane for transfers from the airport to the hotel made it to our shortlist. J was really excited about the seaplane thing, and I wanted it because taking a domestic flight was not a very good option: domestic flight run on a schedule, so it's hardly possible you'll get a flight that fits your international flight schedule perfectly. 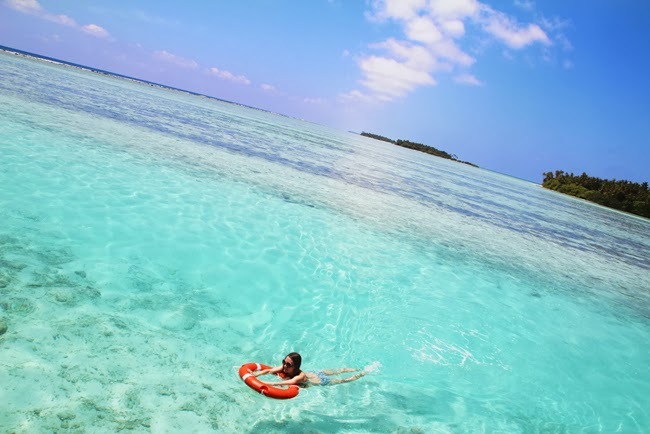 We booked Maalifushi by COMO because it was one of the hotels that offered the seaplane option. What was our disappointment when, two weeks before our stay, we received an email from the hotel telling us the seaplane wouldn't be an option because their legal permits where taking longer than expected. I was so infuriated. We ended up having to take a domestic flight, my worst nightmare!!! From the airport to the hotel on our arrival it was alright, since we didn't have to wait long. But on the day we checked out, they made us leave the resort at 2PM because our domestic flight was at 3PM, and our international flight wasn't until 11:30PM!!! You can imagine how outrageous I thought this was. Anyway, this bad experience aside, if Maalifushi by COMO gets its license for the seaplane, it will definitely be a resort to love, seeing how the domestic flight was the only thing I didn't like about it. All in all, it was an amazing honeymoon the hubby and I enjoyed to the maximum. We loved every single experience, our relaxing villa, the white sand, the wondrous snorkeling... We swam with sea turtles and sharks, I mean, OMG!!! It was also specially nice to get there on Valentine's Day, the hotel had a special exquisite dinner menu for the occasion, and it was the best Valentine's Day of my life!